Back in stock for 2016! 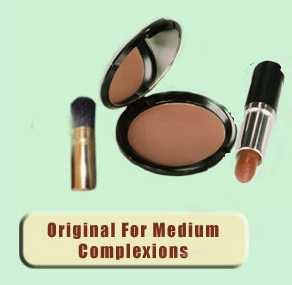 Desert Dust - Original for medium complexions. For best results, allow a moisturizer or foundation to set for a few minutes. As Bronzer, sweep lightly all over face with brush. Concentrate on cheekbones, temples, forehead, nose and chin. As Blush, apply lightly to the apple of the cheeks using diagonally upward strokes and blend well near the hairline. As Countor, use brush fully extended. Apply to the hollow of the cheeks, sides of nose, temples, jaw line and chin. As Eye Shadow, extend brush partway, or use sponge applicator. As Lip Tint, use sponge applicator, stroke onto lips. As Nail Color, use flat side of sponge applicator, apply the powder to clean bare nails. Buff in evenly. Follow with clear polish or top coat.